E-commerce disrupted the traditional industry as it reaches the new heights by creating new stakeholders and by enlarging its scope. E-commerce means ease of doing business, accessibility and customer-centric approach. The e-commerce was not so flourishing when it started new but gained its pace and progress with time and since then it has undergone drastic changes. Below we will see what has changed for this sector this millennium. In the US alone the m-commerce sales are expected to reach over $85 billion. This major shift has happened in the sector only in last decade with the explosion of smart devices and extending the boundaries of the web-based e-commerce through mobile platform. Companies now have to maintain the web as well as mobile channel in order to sustain growth and survive in the market. Traditionally it was believed that the apparel business cannot survive if customer cannot touch and feel the product but e-commerce took the chance and busted the belief. Customers are more than happy to buy apparels on the web. With the emergence of new tools which shows the customer hoe he/she will look like, the category is expanding on every day basis. Online reputation management, the “Like economy” has grown fast and has impacted the companies in the manner they have never imagined. For any company today, major portion of their marketing is covered by the social media channels and the promoters of this marketing are not the paid professionals but individuals like us who are free to praise or criticize the product to their liking. Hence, today a brand is not what company tells to the customers but it is what the people discover on the web through other people. With all the technological development backing the e-commerce business, the customer has become more demanding. Whether it is point-to-point tracking of the parcel or exchanging a product, the customer feels more empowered in involved a lot more than it was in traditional process. Because of such great involvement of the customer the boundaries of the industry are changing rapidly. Industry ecosystems are being changed by the mass collaboration. Today products are not created by a handful of team members but many of them are created with thousands of members on team. Well established products are facing the threat from this crowd sourcing which is creating the same product offering the same value at low costs or null. From powerful microprocessors to greater bandwidth, from cheap and reliable media storage to cloud e-ecommerce has received a big boost on technological front which is responsible for the adoption of e-commerce across the globe. In recent months the system of cash-on-delivery has gone down and customers prefer mobile wallets to make payments for their online purchases. In fact, the cash-on-delivery has been reduced by 8 percent. 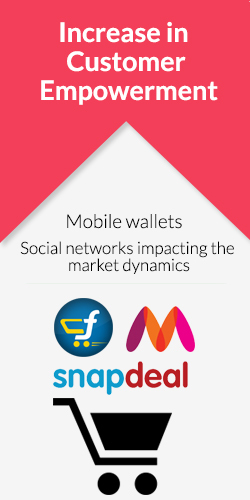 Mobile wallets are the preferred choice of the customers even more preferred than the online banking transaction.